Wow, can you believe it's Friday again already? It seems like the week just flew by - partly because we've been snowed in for most of that time! But it's time to get our whoop whoop on, so let's get started! This week I was honored to make some memory pillows for a friend of mine. Her father died last year and she wanted pillows for herself and her children, made from his shirts. 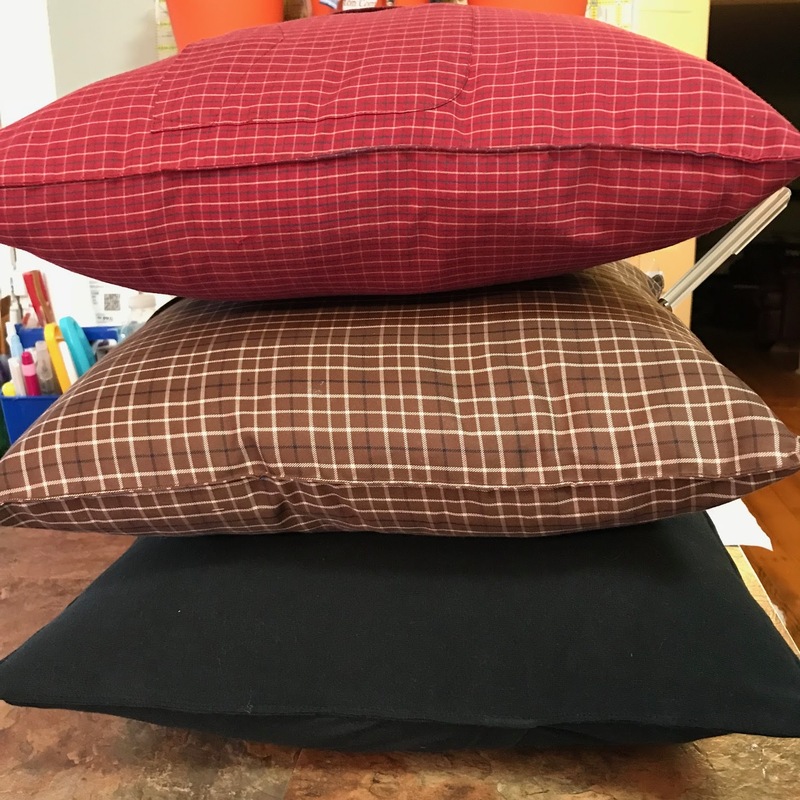 These are very simple pillow covers - the buttons on the regular shirts serve as the opening to insert the pillow. The pockets are there to hold kleenex, a tiny toy or small book. The T-shirt pillow has an envelope closure on the back. But the best part? When I delivered them to my friend, her youngest came over, peered in the bag, and grabbed the red one, saying "MINE!" I'm so glad to know they will be well-loved! And lastly, my friend Amy at Diary of a Quilter shared this wonderful meme on her Instagram feed and it was too good not to share with you all! It also provides a really good opportunity to remind you that the Hands2Help Charity Quilt Challenge 2018 is just over the horizon. Let's do some little bits of good together! Sorry Sarah, I've messed up the photo on the link, so I have put two links. Please can you remove the blank photo link - I can't work out whether I can do that myself. Absolutely love the memory cushions. I do enjoy using the front of a shirt with the buttons as the back of a pillow. It makes a neat closure with so little work. The pillows are fabulous. What a great way to use up the shirts. We've made the pillows with shirts, too - wonderful memory pieces that can be shared by more family members than a single quilt. Very intriqued with the new quilt pattern. Great Pillows you did fro a friend. Sorry you were snowed in this week. Oops! For some reason I linked up twice! Sorry! I love the shirt pillows. They are definitely on my list to do. The pillows are a great memory. I like the use of the buttons. I am sooooooooooooo glad it's Friday. It's been a crazy work week. 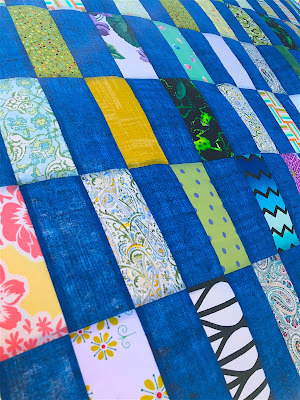 That is a scrumptious scrap quilt! And I really love the pillows - how clever to use the shirt buttons as the opening. I never come up with those ideas on my own, so I really get a kick out of them. 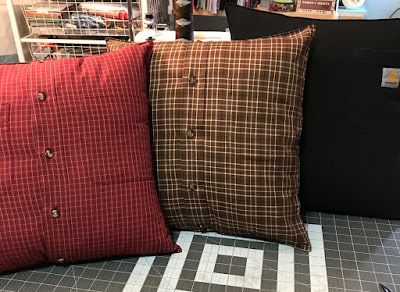 Love your cute pillows and your scrap quilt. Don't you just love quick projects? And to help your friend is really sweet of you. Hope you have a warmer week. I have two of those wonderful pillows! One from each of my grandfather's shirts. I had the best grandpas EVER! It does kind of feel like I am hugging them again. The memory shirt pillows are wonderful! So thoughtful of you. Thanks for sharing the memory cushions... another great way to use shirts. A friend had teddy bears made of her husband's shirts to give to the grands. I like the simplicity of the pillows. What is involved in being a guest blogger? I'm looking forward to both the Hands2Help and Scrumptious Scraps. I made a pillow this week, too! Also, I'm so sorry, but for some reason I linked my blog up twice. I thought the first time didn't go through but then, of course, when I checked after the second try...there I was! Sorry about that. But thanks for hosting this each week -- I enjoy checking out what everyone is doing and finally have something to share myself! The pillows are so special. The little one claiming a pillow right away if precious. Sweet memories.